Today was the annual Hoshi Matsuri at the Agon Shu Temple in Kyoto. I was surprised to see it being broadcast on so many different television stations live, including the BBC. Were you watching in your part of the world? The Hoshi Matsuri is a festival that looks to the ‘the star of destiny’, the star that is said to determine a persons happiness and misfortunes. Fortune telling by the Agon Buddhist astrology gos back a long way and is called ‘Mikkyo Senseijyutsu’. As well as reading into a persons fortune, the Hoshi Matsuri Goma-kuyo festival (fire rites ceremony) is supposed to help in changing a persons luck and bringing good fortune. This is the part which is widely shown on television with huge fires burning in the center in to which are thrown the gomagi. 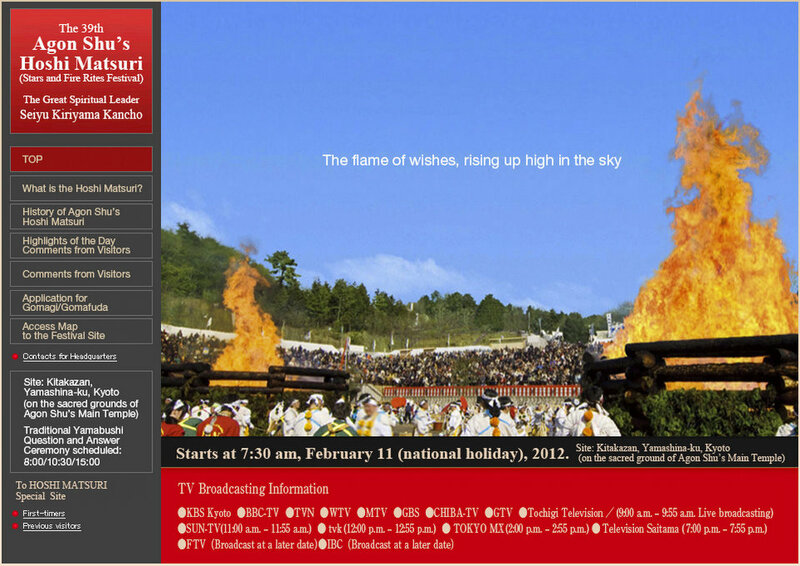 The timing for this festival is setsubun for the New Year. I may try and attend next year and take some photos.